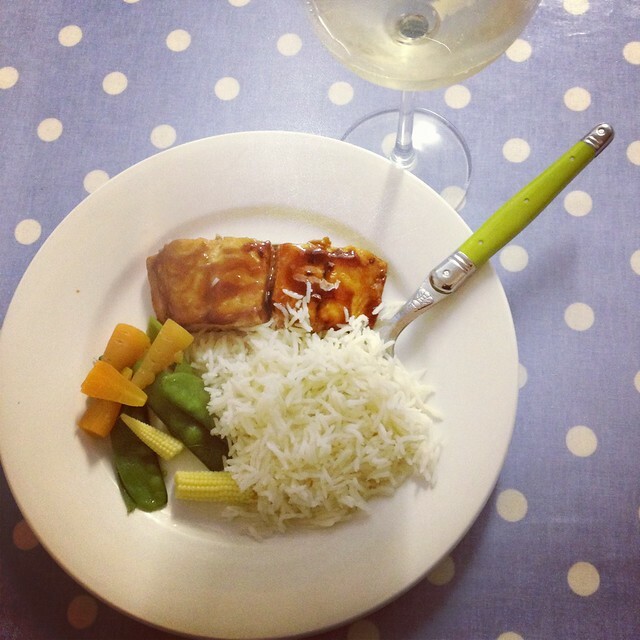 Sweet Chili Salmon w/ basmati rice and veg- 11 pro points. I lost 3 lbs this week and I couldn’t be happier. I had a very difficult week and tried really hard to not nibble and munch my way through it. I’ve been doing Weight Watchers since May and I am used to eating within my points. I’ve been on 26 pro points since Weight Watchers changed in January so nothing new has changed. I just felt hungry all.the damn.time. It was horrible. I would eat a meal and 20 minutes later I had this hollow empty feeling in my tummy. I drank lots of water this week to try and fill up. I ignored the feeling knowing that I had just eaten and I couldn’t possibly be hungry. I also gave into the feeling and ate something, usually a 2 pro point fruit bar, and immediately felt like I was going to be sick. I wasn’t hungry at all and I had just pushed myself into too full about to be sick level. So a hard month. I’ve also upped my walking. Being a lazy cow I usually drive to pick Squidge up from school. Usually this is because she has an activity immediately after school and I don’t have the luxury of walking. If I’m honest there are 2 or 3 days where I can walk to pick her up but I chose not to. So there you go I’m doing a little bit more each week which is something my Weight Watchers leader says to do. Hoping and praying for the best and not beating myself up when I screw up. I’m looking at you Sweet Chili Chicken sandwich I scoffed yesterday. I need to remind myself that I can eat anything I want I just need to point it out and I can’t eat it all on the same day. Today is another day. The sandwich is eaten and all I can do about it is do better today than I did yesterday. I’ve been given the opportunity to work with Weight Watchers to try out some new foods they’ve come out so I’ll be featuring some of it here during my WWW posts. I buy a range of Weight Watchers and store brand foods myself so I will always disclose when it’s something I’ve been given. I love www tomato soup. I generally have that and toast for lunch. I lie that the cans are portion sized, I never eat half of one of the big cans. I was sent a ‘thing’ called skinny sorinkles recently to review, it does fill your stomach and stop that empty hunger feeling but I felt like I was pouring chemicals into me and it tasted fairly foul. I haven’t one a review yet as I’m not sure how positive I could be about it except the ‘stomach full’ thing. If you want to try ill send you some but won’t be offended if you pass. I love the www plan as it teaches change, not diet. I lost my wight on it, have mainly kept if off but go back to point counting when I start to gain. You are doing really well, I look forward to seeing your weight watchers food posts. I think the new WW soups are pointed per can. I know that the chicken noodle soup is pointed at 1 pro point for the entire can! Eew! The skinny sorinkles sounds vile! I agree about the plan being a way to teach you to change your eating habits. I think portion size is the main thing I get out of it. My portion sizes were out of control. It takes a while for your body to adjust and for you not to be hungry all the time but it does happen. Your tummy adjusts to a normal portion size and I find when I do over indulge I feel awful! Maria you sooo need to do it. I can not tell you how fantastic it feels to lose weight. To know you’ve lost it the best possible way, slowly. Like I said your body adjusts to smaller normal sized portions. The one thing I struggle with still is finishing Squidge’s meals when she doesn’t. That odd sausage here and there adds up. I try really hard to make just enough so that there aren’t any left overs. Do it!! !